Technology is changing the world faster than society imagines. In the last 10 years, the number of consumers using mobile apps has grown exponentially. A report from comScore reveals that from 2007 to 2015 mobile users had quadrupled from nearly 150 million to 4 billion around the world. If game apps were at first the most popular between Internet users, recent researches reveal that retail apps have been gaining ground lately. According to Apadmi, consumer and enterprise mobile app development, 85% of smartphone users in the UK use retail apps, a trend that is becoming popular all over the world. Mobile commerce is growing so quickly due to the comfort that users feel with purchasing online. For example, it was proven that 63% of all online retail visits in the 2015 holiday season were made from an electronic device. Furthermore, in Spain, the percentage of mobile transactions in eCommerce has grown 15% over the previous year. It’s clear that technology is changing not only society, but also the way stores do marketing and make profits. With the rise of smartphones, mobile technology is transforming retail industry. Only in 2015, customers spent 1,5 trillion dollars on purchases in store that originally started by digital interactions. Mobile devices allow customers compare and purchase products from everywhere which is available 24/7. In terms of sales, it allows brick-and-mortar shops increasing its benefits. That’s why this kind of companies are looking at ways to enhance the experience of whom may visit their sites. Consumers feel now comfortable buying directly from a mobile application. The ability to make this kind of purchases has been around for years, which has given them time to embrace the new channel. That’s the cause why the number of people who are doing has increased rapidly. By using a mobile app, for example, a customer save time and money when is bound to buy a good. Nevertheless, they won’t take anything on the Net if they consider that their experience isn’t good enough. The main challenging for retailers is how to define a good strategy for increasing the customer engagement and enhance the mobile shopping experience. Customer loyalty. That’s what retailers dream to achieve. But it’s necessary to change the way of thinking. For years, one-and-one relationships have been an ongoing quest. Beacon and geofencing technology don't mean that companies should lose contact with customers, rather both might boost business relationships and increase benefits. 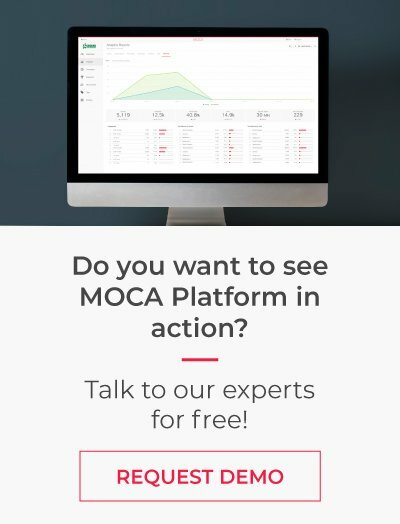 Beacons are location-based technology that broadcast a signal that a smartphone can detect when users open a specific mobile app. So, as soon as the mobile device enters a beacon range it wakes up and notifies the app. Beacon technology is used by a large number of shops to promote their business. This kind of technology creates an alert when someone approaches or leaves a shop. Then, a retailer or any company can push timely messages to that customer promoting products or giving extra and useful information. 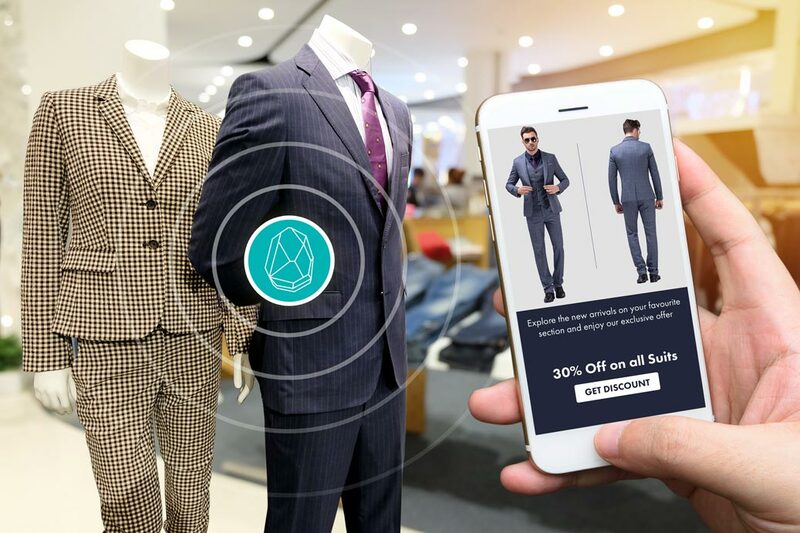 Nevertheless, it’s necessary to have downloaded previously retailer’s mobile app, when it’s done the company could use beacon-triggered messages to capture customer attention and get new sales. 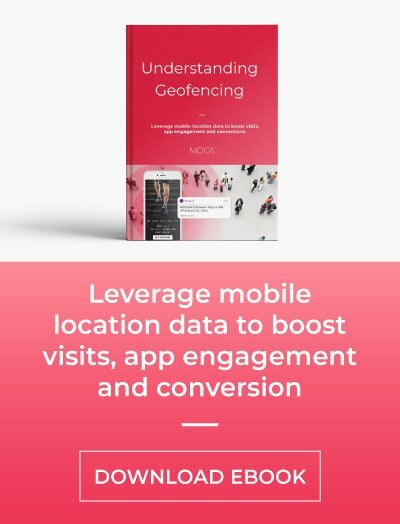 Although beacons are the most popular in location-based marketing, geofencing is a very popular marketing practice too. Its purpose is to detect the user presence within the fence. That is, it works in order to attract customers in a general area. When they are at least 100 meters away from the place, they may receive mobile notifications about that particular place. 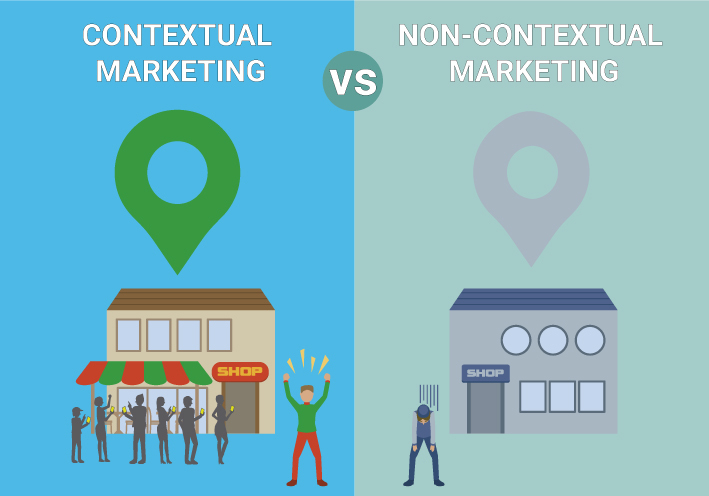 Geofences and beacons work to achieve the similar goals. These two technologies are in fact complementary, rather than conflict with each other. So how can you determine whether to use geofences, beacons or both in your app? A good rule of thumb would be to think of geofences when you want to interact with a customer in a geographical area down to 100 meters at most (“macro-location”). When you need a finer precision down to centimeters (“micro-location”) you should use beacons instead. The customer holds the key to every successful retail operation. In fact, retail principles are based on clients as the most important person in the business, detail, that is the same to say that every retailer must focus on improving the understanding of customer's journey. Many companies are using proximity marketing to their mobile campaigns. Some of them are very popular. IKEA became the largest furniture retailer by bringing an innovative approach to the market with their ready-to-assemble furniture with modern architectural designs that can be bought at an affordable cost. They were also disruptive on their social media campaigns and when they introduced augmented reality to improve customer experiences. By adding Beacon technology to their store in Graz, Austria they wanted to boost in-store experience with proximity marketing campaigns. For this purpose, beacons were placed throughout the store, at the entrance, lobby, restaurant and the checkout area. 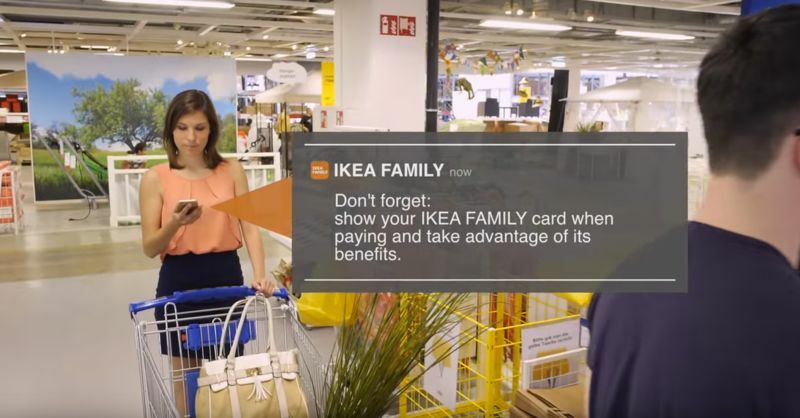 In-store push notifications triggered by beacons were sent to mobile shoppers who have the IKEA Family app downloaded and Bluetooth enabled. Welcome messages, free coffee offers and reminders to use the rewards card are some examples of the campaigns they delivered in order to achieve a new level of customer engagement. Known as an innovative company, IKEA used location-based technology to communicate and enhance the customer shopping experience. Located in the heart of London's West End, Regent Street is one of the most famous premium shopping streets in the world. With more than 3,000 feet of storefronts, Regent Street offers the finest collections, but exploring the high street to its full potential can be limiting if the consumer is unaware of what is nearby and what in-store offers may be available. To solve that problem, the Regent Street shopping app was launched.  It aims to provide customers with useful content such as in-store promotions and exclusive offers. The beacon-enabled app sent attraction campaigns with alerts from boutiques and restaurants as the shoppers pass by. The Regent Street app’s ongoing project has successfully reached over 120 retailers that already deployed beacons on their stores. The app also let the users add their preferences, allowing brands to reach shoppers with a specific profile. The guided shopping app then ranks offers by personal interest. Since its launch, offering redemptions via the mobile app have increased more than ten times. The success of the Regent Street app may have potential at other international high streets. US Department store chain Nordstrom has been working to create personalized, relevant and seamless shopping experiences to their customers. Following an omnichannel strategy, they have been improving their stores, web and mobile app to adopt a customer-centric approach in all channels. To bridge the gap between the shopping experience in their brick-and-mortar stores and the online channel, Nordstrom used location-based marketing services with beacon technology. The retailer deployed beacons in their stores and sent contextualized messages when their shoppers were visiting or passing by a store. For example, if customers have any item on their mobile app shopping cart and enter a shop, a message would be sent informing that these items are available and where to find them. 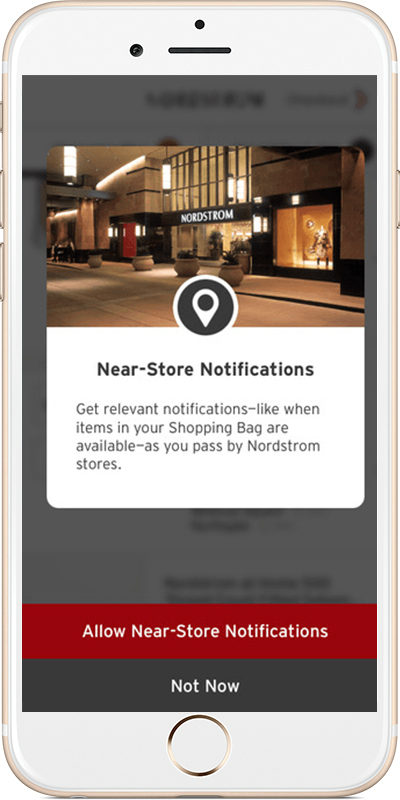 This innovative initiative through the use of Beacon technology is helping Nordstrom to enhance the in-store experience. We live in a hyper-connected world. The customer journey has become more complex and customers make decisions in-store, online and using mobile devices (smartphones, tablets, phablets). So, if retailers want to stay competitive and increase their profits, they must adapt to new ways of doing marketing and embrace new technologies that help them to anticipate the needs of their customers.